Are you a reining queen or a dressage diva? Does your adrenaline rise with the sight of western spins and stops, or are you left speechless during the demonstration of tempi changes and piaffes? Watch as dressage Olympian Charlotte Bredahl and reined cow horse champ Sandy Collier try to one-up each other at the first Platinum Performance Exhibition of Champions, part of the Destination Equus 2007 California Elite Farm and Winery Tour in Santa Ynez, Calif. I love dressage! But I believe reining has won!! This video is awesome and I love it because I love horses. Lots of fun watching these two trying to outdo each other. Loved both horses and watching them do their stuff was great. Couldn’t pick a winner though, they both are champions. Rock on, Charlotte, ROCK ON!!!! both of those horses are really pretty! especially sandy’s! I am 100% an english rider, but i have to say, the amazing control that he had over his western horse was astounding! 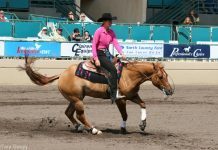 It made me want to try reining. Watched it again! Love it! Awesome! I enjoyed watching this one! Looks like both riders were enjoying this so much. Both beautiful riders and great horse in their own rights and disaplines. Just beautiful, how east meets west!